Bottle 30 ml 1 FL. OZ. Particularly suitable fluid lotion for intoxinated scalp and skin. With its essential natural oils it eliminates metabolic tissue remains, normalizing skin, scalp and hair. Special fluid lotion for intoxinated skin and scalp. For powerful, elastic and relaxed skin and scalp. It can be used in different ways: distributing some pure drops on the zone to treat; in special treatments adding some drops to the ESTÉREL cosmetics or adding some drops to water for baths, compresses, vaporization as requested. 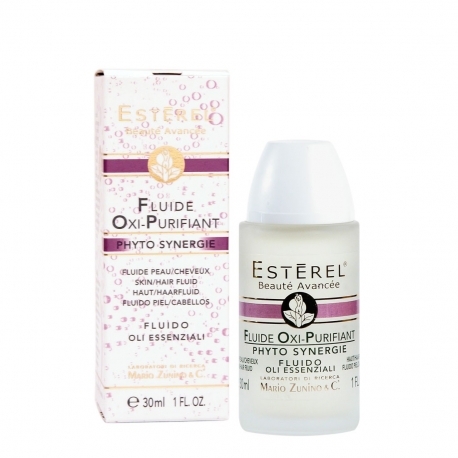 Specific fluid lotion for weak skin or poor hair oxygenation. Its formula based on essential oils, hydrates and invigorates, stimulating and calming skin. 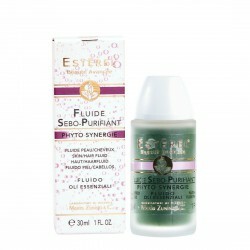 Fluid lotion studied for skin and scalp with problems of redness and acne. Specific lotion for skin and scalp stretched, intoxinated and suffering. Its essential natural oils develop a deep skin cleaning. Particularly suitable fluid lotion for oily hair and oily skin. Its essential oils develop a delicate astringent action normalizing the sebaceous secretions. Relaxing and soothing fluid lotion for scalp and skin. Based on essential natural oils, it prevents the external aggressions like pollution, cold and the inside aggressions like aging. Relaxing and anti-itching lotion. Based on essential natural oils, it eliminates itch feelings on skin and, attenuates the irritations caused by bugs punctures or general swellings. Particularly suitable fluid lotion for irritated, sensitive and sweat scalp and skin. Its essential oils develop a strong and natural lenitive and relaxing action, calming irritations and itches. Aromatic lotion for oily, irritated skin or with acne. Its formula based on purifying essential oils, treats local irritations and infections caused by particular conditions, against microbial proliferation. Particularly suitable fluid lotion for dry or discolored skin and scalp. Its essential oils favor the assimilation of the cosmetics active principles, renewing skin and scalp. 10% Special Discount on your first Order! I consent to receive commercial communications via email. You can change your mind at any time by clicking the unsubscribe link in the footer of any email you receive from us, or by contacting us at info@esterel.it. We will treat your information with respect. For more information about our privacy practices please visit our website. By clicking below, you agree that we may process your information in accordance with these terms. If you cannot find our emails in your Inbox, please check your Spambox. Are you a Beauty Expert? ESTÉREL Beauté Avancée is the excellence brand of the Mario Zunino Labs that since 1961 formulates and manufactures in its Torino plants Hair, Face and Body products, fully respecting the Environment. Nature is for us a precious source of innovative and valuable formula components. These ingredients, along with the most advanced technical and scientific research, are the key to design high-end cosmetic solutions 100% Made in Italy. The reproduction, copying or printing of the website, as well as the contents thereof (including images, graphics and videos) are permitted only in order to place an order on esterel.it. Any additional processing, duplication, dissemination and / or public reproduction beyond the permitted represents a copyright breach. This violation will cause a specific warning and not merely a request for damage compensation, but also a legal action for damages compensation. MARIO ZUNINO & C. S.r.l.